This is, unfortunately, probably a very unoriginal post. So far this week I’ve seen at least 3 other blogs post Chocolate Peanut Butter Easter Eggs. But I had decided to make these before I saw those posts and my heart was set on them, so I’m not changing my plans. These Chocolate Peanut Butter Eggs are very easy to make and are a sure crowd pleaser (unless you are my mother who can’t stand the combination…weird-o). Be warned, the recipe below makes 36 medium/large-sized eggs. I realized part way thorough that I should have cut everything in half. Then again, you can never have too many so maybe not. The recipe below calls for a semi sweet chocolate coating, but if you prefer a dark chocolate that would work equally well. Hope you all have a joyous Easter! In an electric mixer, combine the powdered sugar, peanut butter, and butter. Once combined, add the milk one tablespoon at a time until doughy, much like play-doh. Form the dough into ovals or egg shapes. Place on a cookie sheet and freeze for about an hour. 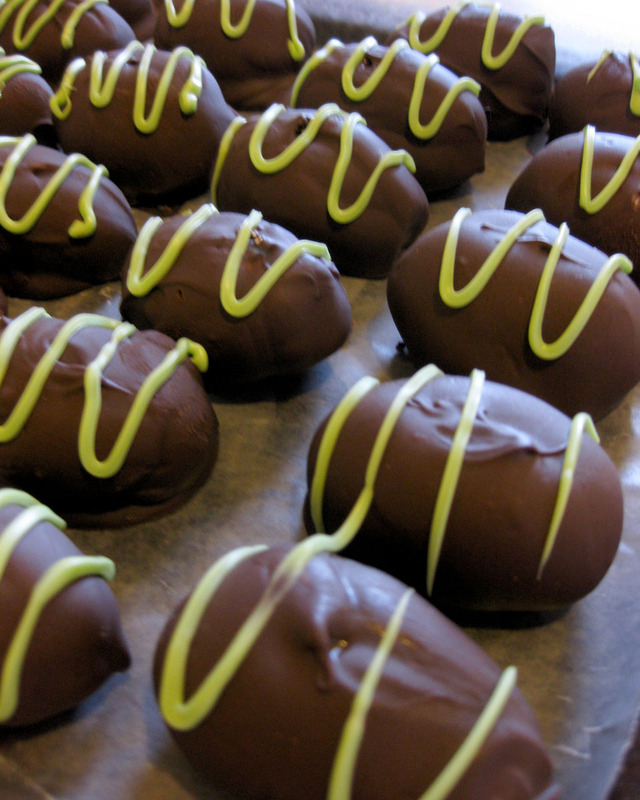 In a double boiler or in the microwave, melt chocolate chips and shortening. If using a microwave, heat at 30 second intervals, stirring at each break. Dip each egg in melted chocolate and place on waxed paper until hardened. You can refrigerate to speed up the hardening process. (You can use a skewer to dip the egg in the chocolate. Slide skewer off immediately and cover hole before it hardens.) If you need additional chocolate (which I did), for each additional cup of chocolate chips add 1 teaspoon of shortening and melt as described above. Optionally, trim excess chocolate at base with a warm knife and/or decorate with royal icing or melted chocolate/candy pieces. This entry was posted in Baking Jumbles, Slutty Jumbles and tagged chocolate, easter, peanut butter. Bookmark the permalink.